Join multiple tables in excel. Create the tables you want to join and then click the "Join multiple tables" button to get the following window opened. Select the left table key columns you want to join with. Select the join type. The join type is used to join the left table with the right table based on the specified key columns per row. The default value is "INNER JOIN" For more information on join types click "help on join types". Select the right table key columns you want to join with. After all fields are completed ("Left table key column" and "Join type" and "Right table key column") a new row is added automatically. A join row can be removed by clicking the "X" button on the right side of the row. Note that only the last compleded row can be removed. This will open a new window with the information about the join types. Select the output columns to be displayed in the result data. By default all collumns are selected. Indicates if a column is a key column or not. Column name in the form of Table.Column. If selected then only distinct(unique) rows are exported into a new worksheet. Click Run to execute the join multiple tables process and write data results into a new worksheet. 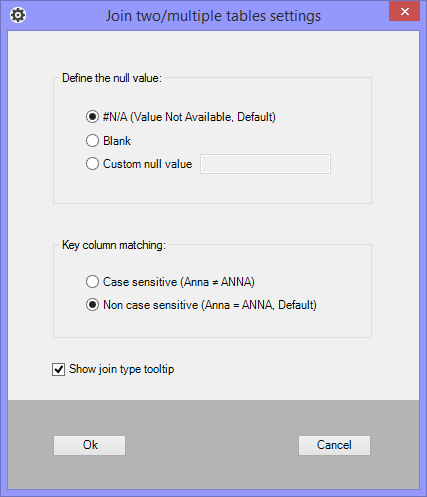 Click Cancel to close the Join multiple tables window. CTRL + PgUp - Switches between worksheet tabs, from left-to-right. CTRL + PgDn - Switches between worksheet tabs, from right-to-left. CTRL + LEFT ARROW - Scroll to the left by one column. CTRL + RIGHT ARROW - Scroll to the right by one column. CTRL + UP ARROW - Scroll to the left by one row. CTRL + DOWN ARROW - Scroll to the right by one row. CTRL + HOME - Scroll to the beginning of a worksheet. 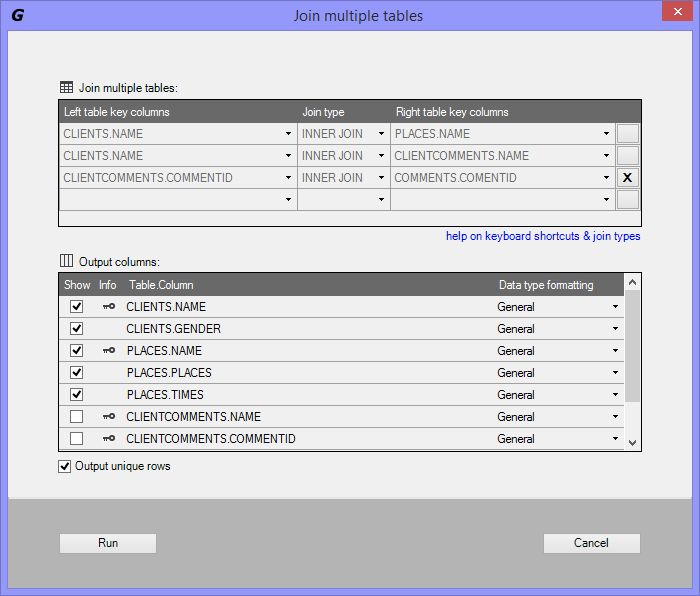 Not used in "Join multiple tables".